Sunrise Villa is aptly named for it's gorgeous daily views of sunrises and sunsets. Have your camera ready! The attention to privacy and relaxation coupled with the proximity to all Aruba has to offer make it the perfect choice for your '' home away from home''. Inside, the layout of the open concept living area is functioned and smart offering you entertainment/TV area, dining area and a lounge area. All three bedrooms have air-conditioning and besides the master bathroom there is also a full second guest bathroom. The Dining, Living and TV room are also fully air-conditioned. The large and spacious porch overlooks the oversize swimming pool with lounge chairs and offers all the privacy you want in this tropical backyard garden. Dine at home comfortably with the large gas BBQ and porch dining set or choose from a number of nearby restaurants. 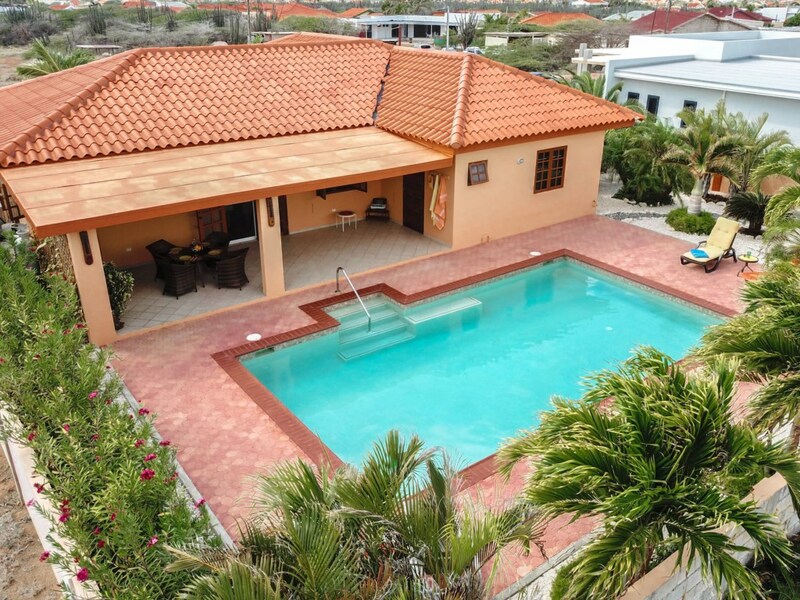 This superb villa is situated in a quiet, upscale neighborhood in the Noord area, only a few minutes away from the splendid beaches, night life, golf courses and shopping areas that will grant all of your vacation wishes. 3 Bedrooms – 2 bathrooms – Bedrooms with air conditioned individual units – air conditioned Kitchen ,Dining, Living and TV room - Wi-Fi throughout – well equipped – Freestanding Private Villa – Ceilings fans in the Living room – Private swimming pool – 5 drive to Palm Beach – Supermarkets, shops, casinos in Palm Beach very close by. The total rate includes 15% tax / service charge, final cleaning, an allowance for water and electricity in the amount of US$ 18,- per night and Wireless Internet. Any overage in excess of utilities, shall be to your discretion and at your expense. Upon arrival a refundable security deposit is required of US$ 400,-. BOOK NOW to stay in June and or September 2019 and get 25% discount of the rental rate! C'était notre deuxième visite à la Villa Sunrise. Magnifique villa bien situé dans quartier tranquille, zen, très propre et bien équipé. Nous avons loué une voiture à l'aéroport avec ALAMO pour 2 semaines très bon service et voiture neuve 2018. Nous sommes proche des plages, restaurants et épiceries. Nous retournerons surement car nous aimons nos longues promenade sur le coté sauvage de l'ile. We loved our stay at Sunrise Villa. A very lovely, private, quiet setting with beautiful sunrises, nature, birds, yet close to beaches and the golf course. It was wonderful to wake up for a dip in the large, private pool and then see a gorgeous a sunrise. Fabulous stay! My husband and I loved staying at Sunrise Villa. Its location is on a quiet street but very close to beaches, restaurants and the high rise area. We love the private backyard and large pool area; perfect for an afternoon of sun-tanning, reading and swimming lengths. Beyond the back fence we were happy to discover a network of trails where we could enjoy our morning nature walks. A drawback is that you will need a rental car while staying here but you will want one anyway to explore Aruba’s many beautiful beaches and attractions.